The iconic Skimobile is what a lot of people remember about Cranmore. Mention Cranmore in skiing circles and most people have three thoughts. That the mountain is synonymous with the town, North Conway, N.H., that it lies in the heart of the beautiful White Mountains, and that it is steeped in some of the deepest skiing history in America. Cranmore conjures up black-and-white photos of Hannes Schneider doing his famous jump turn, of Carroll Reed’s Eastern Slope Ski School, of George Morton’s iconic (and somewhat loony) “Skimobile,” and of a whole gang (at least 20) of Eastern Slope skiers who joined the 10th Mountain Division to ﬁght in World War II in Italy. 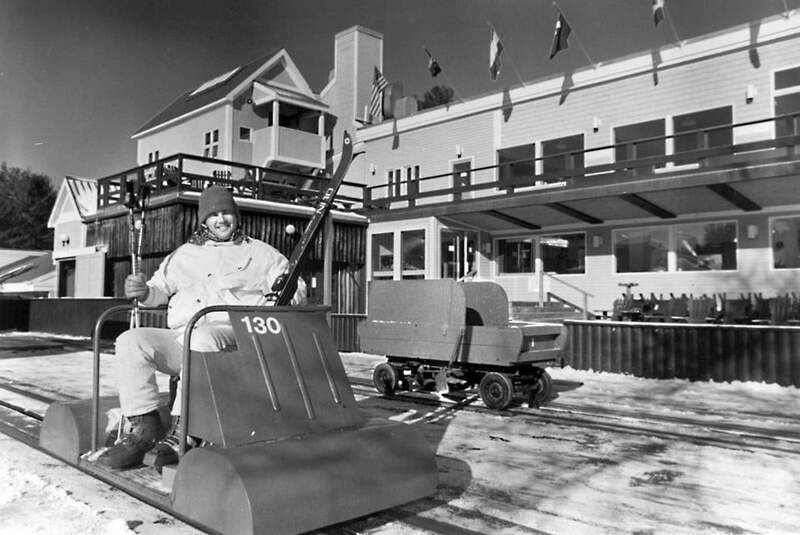 In fact, according to Ben Wilcox, Cranmore’s president and general manager, the resort had an owner in the 1980s who was so fed up with the overwhelming history, he took all the pictures down and gave them away. History, it seemed, was destined to keep Cranmore as a kind of living museum rather than a modern ski resort. 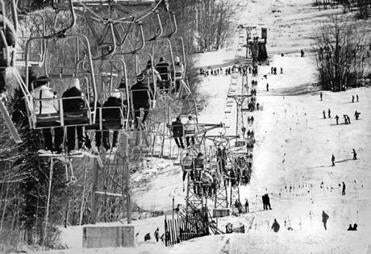 And, Wilcox readily admits, there was a time, as much of the modern ski world was being built and modernized, that not much new was happening on the venerable slopes overlooking North Conway. That hug came last month when Cranmore’s owners, Brian and Tyler Fairbank, unveiled a multiyear, multi- million-dollar development plan that, in a real sense, will tear down aging buildings and facilities and replace them with a new Cranmore. Beginning in 2010, when the Fairbank Group purchased Cranmore, it began investing some $9 million in snowmaking upgrades, new lifts, and increased terrain. The master plan involves six new buildings that will replace all of Cranmore’s existing buildings, with the exception of the ticket office that was renovated in 2010, the summit Meister Hut, and Artist Falls Lodge (ﬁtness center). The skier facilities will be located on the lower level, and include a cafeteria, restaurant, locker rooms, changing area, and rental and retail shops. In all, the skier services area will increase from 28,000 to 45,000 square feet. There are many more reasons why people have flocked for years to the ski area in the heart of the White Mountains. On the second and third ﬂoors there will be two-, three-, and four-bedroom condominiums, a project known as Kearsarge Brook at Cranmore. According to Brian Fairbank, six of 18 of the ﬁrst condos are under agreement. When the plan is executed, it will have 36 slopeside condos. Wilcox, who grew up in the area and competed as a high school and college Nordic racer, has been aware from the start about Cranmore’s history. When he moved to Cranmore from Bretton Woods, he worried that any changes he might make would rankle the old-timers who take such pride in the history. It’s hard to ﬁnd any locals who oppose the development plan. John Avalon from Beverly bought a condo at Cranmore 23 years ago, and with his wife, Terry, raised three kids with ski racing on the mountain. The history, of course, can be summed up with a single name — Schneider — Hannes and his son, Herbert. Famous for his ski school in St. Anton, Austria, during the 1920s and ’30s, Hannes Schneider in fact had developed a mystique around his skiing technique, named the Arlberg, for the region in which he lived. When the Nazis took Austria and invited Schneider to join the party, his refusal, along with the fact he had Jewish friends, landed him in an Austrian jail for 25 days. When ﬁnancier Harvey Dow Gibson, a local, bought Cranmore (then Lookout Mountain) and Eastern Slope Ski School, he set out to get Schneider out of Europe and bring him to New Hampshire. Though details of the negotiations are murky, the result was that on Feb. 11, 1939, with huge fanfare and notice in American newspapers, Schneider and his family arrived by train at the North Conway station from New York and entered the town beneath an arch of raised skipoles held up by Eastern Slope Ski School junior skiers. Herbert Schneider later took over the ski school from his father, who died in 1955. Herbert, who had been one of the 10th Mountain Division volunteers, died in 2012. The school produced many national level skiers — Abbi Fischer, Brooks Dodge, and Terry and Tyler Palmer, to name a few. After his Olympic appearance, Tyler Palmer returned as a coach at Eastern Slopes, and one of his protégés, Leanne Smith, will appear in the Sochi Olympics next month.